Tear It Up! : The Rockabilly Documentary, Produced & Directed by Greg Wolske. Lasso Productions ®. 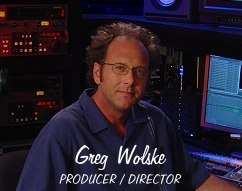 Greg Wolske has been self-employed in his own production and advertising business for most of his career. He received a B.S. in Business Administration from Ohio State University, after changing his major from art to marketing/advertising. Two years in law school followed during which time he began videotaping testimonies and accident scenes for his father's law firm. Legal advertising on television was in its infancy and seeing an opportunity, Wolske was soon producing commercials and placing media buys for numerous law firms. Additional advertising and production clients followed. Wolske has created commercials for bridal shows, hot tubs, used cars, politicians, cosmetic surgeons and numerous PSA's. He has produced many corporate videos, including several for a leading national insurance company. A guitar player since an early age, Wolske began experimenting with audio recording while in college. He purchased a 4 track, multi-track recorder and in the spirit of Les Paul, learned to overdub and bounce tracks in order to record himself playing the various instrumental parts for his original songs. Similarly, Wolske is completely self-taught in film and video production, including video and 16mm & 35mm film camera operations, lighting, location & studio audio, video editing, animation and computer graphics. Producing, writing, directing, designing and creating are also an integral part of Wolske's production abilities.